This cheering, inspiring how-to book, inside and out, provides spiritual and practical guidance for both working and aspiring actors. It gives you, the actor, a unique look at acting as an art, a business and a calling, shows you how to integrate your artistic and professional ambitions with your humanity, and gets you past those mental and emotional obstacles that would prevent you from fulfilling your dreams. Do you long to be an actor but fear you lack the right stuff? Do you hesitate pursuing an acting career because people tell you it's impractical or too competitive? You can't get the roles you want and are losing heart? 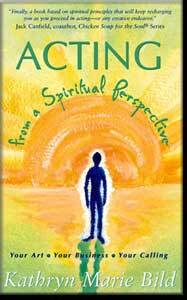 ACTING FROM A SPIRITUAL PERSPECTIVE, a cheering, inspiring handbook, gives you a fresh look at the art and craft of acting and gets you past those mental and emotional obstacles that prevent you from fulfilling your dreams. Acting can be your art, your business, and your calling  a way to express yourself artistically, make a living, and serve the world. ACTING FROM THE SPIRITUAL PERSPECTIVE will show you the way. This is a book of techniques, tips, insight, encouragement and guidance in the actor's career of acting as an art, a business and a calling. "Finally, a book based on spiritual principles that will keep recharging you as you proceed in acting - or any creative endeavor." and there are many sound training tips and nuggets of good advice throughout." "Kathryn Bild was one of my most talented actors and directors. I highly recommend her." E-mail Kathryn for a current schedule.